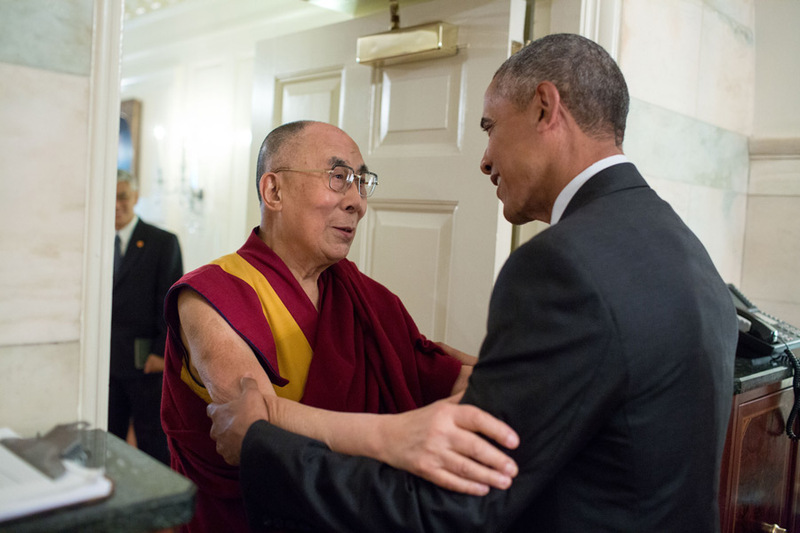 President Barack Obama greets His Holiness the Dalai Lama at the entrance of the Map Room of the White House on June 15, 2016. Official White House Photo by Pete Souza. (TibetanReview.net, Jun17, 2016) – China was left licking its wounded ego as despite its protests, including through diplomatic representations, US President Barack Obama on Jun 15 received in the White House Tibet’s exiled spiritual leader, the Dalai Lama, and met with him for about 45 minutes. However, great care was taken to minimize damage in relations with Beijing, with the president reiterating during the meeting the US position that Tibet is part of China, describing the meeting as personal and holding it in the relative privacy of the Map Room rather than the ceremonially official one of the Oval Office, and without any media presence. The President was also reported to have welcomed the Dalai Lama’s leadership on climate change issues, and expressed support for his efforts to raise awareness of the importance of limiting global warming, including to protect the Himalayan glaciers and the environment on the Tibetan plateau. A photo emerged afterward, first on the Dalai Lama’s Instagram account and then released by the White House, of the two men facing each other, locked in an embrace that spoke volumes about the warmth of their relationship, noted a voanews.com report Jun 15. “China demands the US side keep its commitment of recognizing that Tibet is an internal part of China, and not support ‘Tibet-independence’, or separatist forces,” China’s official Xinhua news agency Jun 15 quoted Lu as saying. Following the White House meeting, the Dalai Lama visited the National Endowment for Democracy (NED) where he was welcomed by its president since its founding in 1984 Mr Carl Gershman and had lunch with 30 other guests. The programme that followed focused on hope and democracy. Those present at the programme included barefoot Chinese dissident lawyer Chen Guangcheng, labour organizer Han Dongfang, Congressman Peter Roskam, Senator Dianne Feinstein, House Democratic Leader Nancy Pelosi, and Hollywood star and Tibet activist Richard Gere who all spoke. Martin Frost, Chairman of the NED and a former Congressman, presented to the Central Tibetan Administration a framed copy of the preambles to the US and Tibetan exile constitutions in recognition of its democratic accomplishments. It was received by the Sikyong Dr Lobsang Sangay who also addressed the gathering. Earlier, the NED presented its Democracy Service Medal posthumously in honour of the courageous work of the Tibetan Buddhist Monk Tenzin Delek Rinpoche. He was a prominent local religious figure who died in a Sichuan prison in 2015 at the end of 13 years’ incarceration. It was received by his cousin Geshe Jamyang Nyima who too spoke at the gathering. The Dalai Lama was later invited to engage in conversation on the theme of ‘Democracy and Hope’ with four young activists: Arzu Geybullayeva, a Journalist from Azerbaijan; Rosa Maria Payá of Cuba Decide; Azaz Elshami, a Sudanese Digital Activist and Rami Soud, a Jordanian Activist. It was moderated by Brian Joseph, NED Senior Director for Asian and Global Affairs. Following the White House meeting, China’s overseas party mouthpiece globaltimes.cn Jun 16 made a scathing criticism of the US president in three editorial page commentaries. One cited Zhu Weiqun, chairman of the Chinese People’s Political Consultative Conference’s Ethnic and Religious Affairs Committee, as saying Obama’s decision showed lack of political foresight, that “his meeting with the Dalai Lama, the head of the Tibet secessionist group, is, in essence a political act meant to divide China”. “The ruling class of the US has never given up its scheme to use the Dalai Lama to split China. Even if they fall short of that goal, they would like to plant the seeds,” he was further quoted as saying. Another commentary said the meeting showed what it called the mean side of Mr Obama, that “having met the Dalai Lama more often than his Western counterparts in the last decade, Obama has set a bad example”. The commentary claimed that the Dalai Lama had done more damage to China than any other exile but did not explain how. It also expressed confidence that “so long as Tibet maintains economic development and social stability, the meeting will be just a farce”. A third commentary, a posting from the Xinhua, demanded that Washington stop playing what it called the ‘Tibet Card’. It called the meeting “an extremely rash and irresponsible act” and an “unwise behaviour” which had “broken the solemn promise of the United States not to support Tibet’s independence, seriously jeopardized China-US relations, and deeply hurt the Chinese people’s feelings”.